1 - Your team�s ability to make lay ups, especially breakaway lay ups. 2 - Reducing turnovers via the speed dribble. 3 - Developing strength and confidence dribbling with WEAK hand. Not to mention, it is a great way to work on conditioning while improving your basketball skills. No running on the lines needed! Specifically in the drill below, Coach Huber teaches a competitive one on one drill that starts with a trailing defender. This is great because it forces the player to speed dribble. If they don�t hustle down the court, they�re going to have a more difficult lay up. This happens because the defender will catch up and force a more difficult shot. Also, if they don�t control their dribble and push it out properly, they�ll lose control or slow down. Also, by practicing with a defender present, you�re going to have more transfer to using the speed dribble during games. Additionally, you work on making lay ups with a defender. Based on the defense�s position, you can practice different finishing moves such as the extension lay up, power lay up, side step (Euro Step), and other moves. It�s also a great way to force players to elevate their weak hand dribbling and finishing. Players will learn how to maneuver your body in different situations. This will help you shield the defense from the ball and control the situation. Ball handler will start a few steps in front of the defender, above the baseline. The defender will start on the baseline on the inside of the offensive player. They both go at the same time. The offensive player is attempting to beat the defender to the opposite basket for a lay up. The defender is sprinting to cut the offensive player off before reaching the basket. Make sure to alternate left and right hands. In the attached video, the coach initiates the action by telling players when to go. With larger groups, you can have the offensive player initiate the action. As soon as the offensive player moves, the defense starts chasing. To get more reps, you can have players going both directions at the same time (as shown in the diagram). Tell players not to cross the "rim line". Push Out - You want the player to extend their hand forward and push the ball out. This will allow them to move faster and cover the length of the court in fewer dribbles. Younger kids will do this in 5 or 6 dribbles. Advanced middle school and high school players should be able to do this in 3 or 4 dribbles. Dribble at shoulder height - When the defense is in proper position and closes their distance, you should try to minimize the height of your dribble. But when you�re dribbling for speed, the only way to maximize speed is to let the ball come up a little higher. This also helps with the angle of the release, so the ball bounces a little higher. This allows you to quickly sprint to it and start another dribble. If you try to dribble at waist level, you�ll go slower. And you may lose control of the ball as it goes too far away when you push the ball out. This is due to the angle of the release. Crossover speed dribble - You can crossover on the speed dribble to keep the defense confused on which side to peak. I�ve also seen the defense accidentally run into the player and draw a senseless foul, which is good for you. Veering - If the defender is on your hip, you can also veer into them. This can make the defender move out of position. Then you can immediately attack and create more separation. When executed properly, this can also put a defender in a bad spot to block the shot. Be careful not to get an offensive foul in this situation or lose balance. This can also be used when close to the basket to finish better. Eyes on the target - As you approach the hoop, you want to fixate your eyes on the target. This is one of the biggest reasons players miss lay ups. They take their eyes off the target. Jump up from above the low block - Due to the speed of the dribble, it�s very easy to fly past the hoop and chuck the ball off the backboard. By focusing on jumping upwards, you�ll still naturally float forwards, but not nearly as much. And this will help you make more lay ups. The change of momentum can also make it difficult for the defense. They will fly by you or foul you. You want to jump above the low block, so you don�t drift too far under the basket and make it easier for the recovering defender block you from behind. You want to keep your body between the defender and the ball. This gives you room to use an extension lay up where you reach to the basket and keep the ball as far away from the defense as possible. That way, if they step out of the way, you are still under control and can finish. If they don�t, you drive through them and maintain a physical advantage. This allows you to score and draw the foul at the same time. Don Kelbick briefly explains this at the 3:20 time mark in the video below. Take an extra dribble or jump stop - If you have a shot blocker behind you in a good position, there are a few things you can do. By using a jump stop, this can throw off their timing because you can jump immediately or pause for as long as you�d like. You can also take an extra dribble and shoot a reverse lay up. This will use the rim as protection. Steve Nash stop - If Steve Nash had a defender on his back, he would come to a complete stop at times. This forced the defense to stop or run into him. If they stopped, he could take off again. This created more separation. It also took away a player�s shot-blocking ability. 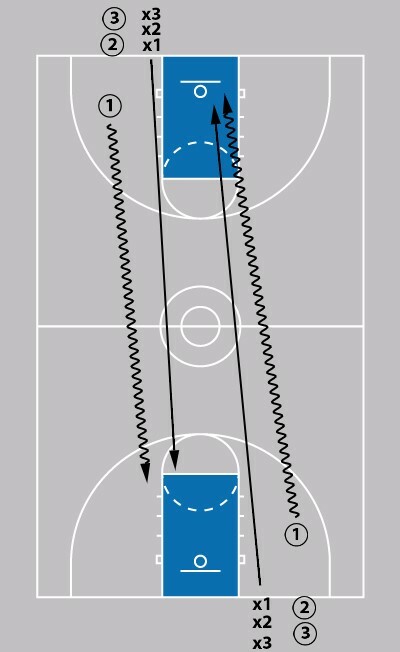 You can also tweak this drill to provide many different situations that occur in the game. You do this by adjusting the distance from the hoop, position on the floor, and the defender�s starting position and angle. Basketball is a very random sport and you will find yourself in many different situations. That�s why it�s important to mix things up. Now, they will know how to handle the situation and their footwork and shooting angles won�t feel awkward. As a result, they�ll attack with more confidence rather than being hesitant. Vary distance from the hoop - You can literally start this drill from anywhere on the court. You can start it on the 3-point line, volleyball lines, half court, � court, full court, and anywhere in between. Vary position on the floor - You can start in the middle of the floor, shade to the side, on the sideline. In a half court setting, you can start on the baseline, wing, free throw line, etc. within half court. Different distances from the defender - By positioning the defender at a different distance, it will force your players to work on different skills. For example, if you want to work on the extension lay up, you might start the defender further behind. If you want to work on moves with the defender on the hip area, you might start the defender a little closer. Vary angles of defender - It�s also important to teach your players how to finish when defenders come at you from different angles. You might have the defender come from across the court, from the corner to represent weakside help, from the outside hand, etc. Mistakes are okay - While there will be certainly more turnovers and missed lay ups at first, this is okay. You will see a ton of improvement in a short amount of time. Weak hand - If your team has a weak hand, you might have them do twice as many reps on that side. That way, the weak hand becomes just their non-dominant hand. Teach the defense how to defend - You can also give some helpful tips to the defense on ways to defend in this situation. That way, the different looks keeps the offense off balance and will make them even better in game situations. You might tell them to mix it up. Go for the steal on the inside hip. Try to poke the ball from behind. Step away at the last second. For shot blockers, tell them to keep a little distance and try to time the block up high. That�s if they can catch up in time. Personally, I wait for my offense to gain confidence prior to teaching the defense these little tips. Well, hopefully, these tips and drills will help you reduce your turnovers and make some more lay ups! If you have any additional insights, thoughts, questions, or comments, leave them below! Love these drills and can't wait to use them! First time on here. I like these drills. I have some younger kids that need to work on their weak hand. Less than full court early on, with younger players, to minimize defaults and stress of going anaerobic.